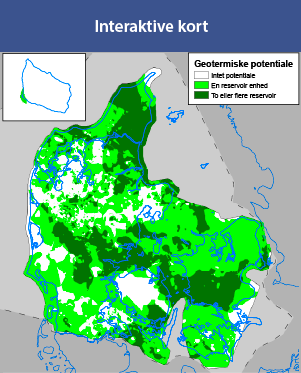 The geothermal energy potential in Denmark – reservoir properties, temperature distribution and models for utilisation. During the period 2010—2015, GEUS has conducted a major research project under the Strategic Research Council (now now the Innovation Fund) in collaboration with Aarhus University (AU), the Geological Survey of Sweden (SGU), the Deutsches GeoForschungs-Zentrum (GFZ) and the Danish District Heating Geothermal Company (DFG). The project has focused on better characterizing and mapping of the geological and geophysical parameters that are most important for optimal utilization of geothermal potential. The project has analyzed all available relevant geological and geophysical information, as well as integrated new data, methods and models to define, map and characterize the potential geothermal reservoirs. The ‘Geotermi WebGIS Portal’ contains significant analyzes and results in the form of summaries, results and interpretations presented in a clear interactive form (read more under DSF-Geotermi: Background).